I was in search of the best dictionary app (software) for my ubuntu as I recently started reading many ebooks. As English is not my native language, a good dictionary app is always the best friend while reading. I have tried many dictionary app but I finally I have settled on the dictionary app called "Artha". "Artha" is a Sanskrit word (an ancient Indian language) which means "meaning" in English. Apt name for a dictionary app, right? 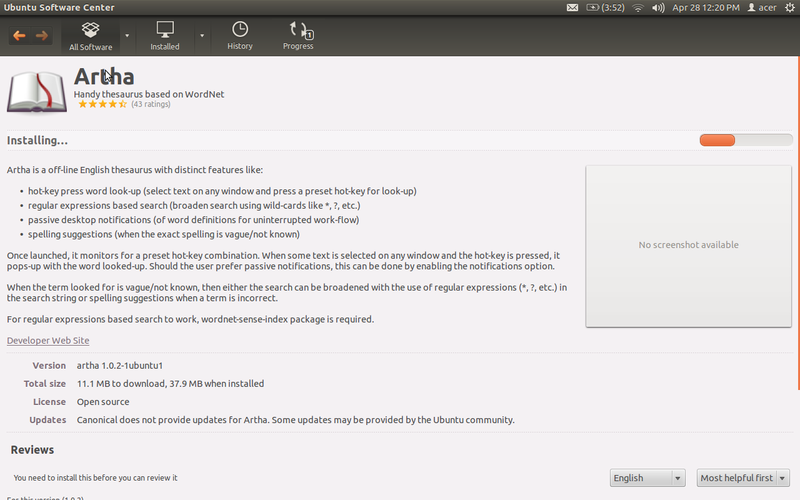 The best part of this app is that it works offline while most of the dictionary apps available in ubuntu needs internet connection for working. Let's see some of the features of Artha from their website. For a given word, the possible relatives shown by Artha includes Synonyms, Antonyms, Derivatives, Pertainyms (Related Noun/Verb), Attributes, Similar Terms, Domain Terms, Entails (what verb entails doing), Causes (what a verb causes to), Hypernyms (is a kind of), Hyponyms (kinds), Holonyms (is a part of) and Meronyms (parts). To know more about each category of relatives, click on it for an explanation and example. Once launched, Artha sits on the system tray and looks for the pre-set hot key combination press. You can select some text on any window, and call Artha by pressing the key combo. Depending upon the option set, Artha with either pop-up with the word looked-up or will show a passive notification of the most important definition of the searched term, from the system tray. 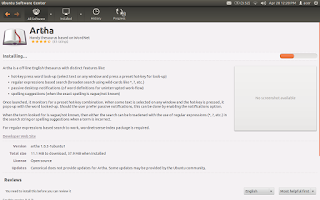 You can install it on ubuntu from software center. Just type 'artha' in software center and install it.